Yesterday evening, the poet Heather Christle drove to Cleveland from Yellow Spring, OH to read and discuss her poems at Case Western Reserve University for the Poets of Ohio reading series. Below is an excerpt of the introduction I gave for the event. In “That Air of Ruthlessness in Spring,” the opening poem of The Trees The Trees (Octopus Books, 2011), Christle writes: “I want to show you something I don’t care what I want you to look where I say” (3). While thinking about how to access her book and the poems therein, I read this passage as a directive. And where does Christle want us to look? Well, she tells us twice in the title: to the trees, of course. We may touch, love, explain. Conversely, in Philip Larkin’s poem “The Trees,” our arboreal counterparts remind us of our own mortality, such that “Their greenness is a kind of grief” when we realize that, unlike the trees in spring, our bodies do not regenerate with the seasons; rather, they simply decay. Armed with these mediations on trees, I returned to Chirstle’s book with one basic question: “How does the poet show us trees and their mere being?” What I gathered is that showing us trees is a bit of a conjuring act, in that, yes, there are “trees…all around us,” but they “move themselves across the planet in wide invisible lines” (46); to see them, then, is to see something that is invisible, ethereal: the “nothing that is not there and the nothing that is.” It is the poet’s duty, perhaps, to show us that nothing; to feel that nothing; to experience that nothing; to be that nothing. Luckily for us, the invisible nothing of trees finds fertile ground “to in live” in each little “rectangle” (18), which are the prose poems of Christle’s book. And as the trees grow within these rectangles, the speakers of the poems “hang upside down” (56) from them, “fall back up into” (51) them, and are the “noisy” singers who remind us that, yes, the trees do indeed love us (59); because, without the voice of the poet telling us otherwise, we might not know this to be true. Christle’s collection of poems welcomes us into “a tree-based society” where “women and…men all live in trees” (42), appreciating the “greenness” not as grief, but as a place to “Begin,” as Larkin wrote, “afresh, afresh, afresh.” And although Larkin was correct in acknowledging that we cannot repair our bodies, Christle comforts us in the knowledge that, in this freshness, we can repair our “ruined” souls (57) as we “move faster” through our lives “toward that tree which does not care” (55) because it simply exists in its mere being. The next Poets of Ohio event will take place on Tuesday, 18 March with Dave Lucas, followed by a 27 March event with Tyrone Williams. 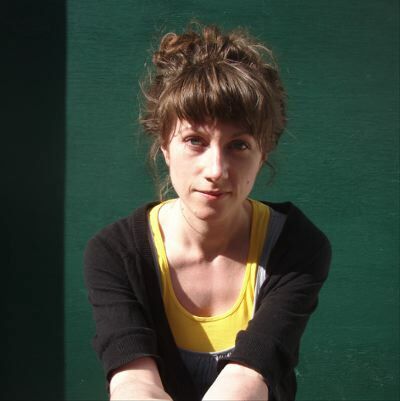 This semester’s series will conclude with a 10 April reading and discussion by Larissa Szpourluk. Best Thing I’ve Heard Next Week: Heather Christle Revives Her Phone Poetry Campaign! To celebrate the 100,000th person following her blog Heather Christle will be reading poems on July 3rd from 9am-12pm and 1pm-5pm Est! You may recall the splash her first phone-call campaign made (almost exactly two years ago!) when she celebrated the release of her second collection The Trees, The Trees. You can find all of the necessary details for a phone call at her blog. Shew! We finally made it to the end of the countdown. Thanks for all of the encouragement and support over the past couple of weeks. It’s been a really great run. The reading is only two days away! Don’t forget. (Not that you could, I’ve been hammering you in the side of the head about it.) To cap off the series of single-sentence reviews I bring you Heather Christle‘s The Trees The Trees from Octopus books. Also, this upcoming spring you should keep an eye out for her next book What Is Amazing which will be released by Wesleyan University Press. These poems are little baby labyrinths on the page and I triple-dog-dare you to not get lost in them… instead, weave in and out and about them without a thread to find your way back – you don’t want to go back there, it is better inside. Heather Christle is not a cowboy. She is many other things. For instance, she recently proved to be very good at answering your telephone call. Some of her other talents include: wearing bold head-wear, wearing nothing on her head, and most importantly, writing poetry. I am so very glad that she will be reading at Vouched Atlanta’s launch reading. You should be too. To help promote your poetry collection, The Trees The Trees, you released your phone number on the interwebs so that people could call you hear you read them a poem. So here’s my question: did you ever consider reading them with a foreign accent or an impersonation of some sort? Like, if I called you right now could you read me one as Sam Elliot? I’m not a very good cowboy. Once at a party in Portland where I only knew a couple people, I pretended to be Russian. It pretty much worked. I don’t think I will try it again. What inspired you to pretend to be Russian? Have you ever been to Russia? I like the fuzzy hats they wear, you know- Ushankas. You look like a dandelion! From the back! A dandelion! You look like an animal walking away from here. That must keep you warm. You must be sweating when it is 10 degrees outside. That is a great hat by the way. That is a great hat. I thought you were a snow bear. You look like a macaroon. It’s not that cold out. I used to have a hat like that. We all used to wear hats like that. A: Can I borrow it tomorrow night? A: If I give you a free coffee will you give me that hat? A: Can I touch your hat? A: I have been wanting to do this all night. Wow, that sounds like it is most certainly a conversation starter. I like the part where the lady pawed the pom-pom at the restaurant. Do wear a thinking-cap while you write your poetry? If you don’t, would you be opposed to wearing one? Would it help? I like for there to be nothing on my head when I am writing. I even have to pull back my hair. If I am too aware of my head I find it difficult to concentrate. So what happens in your head when there’s nothing on your head? Where does your inspiration come from? It depends. I go through phases. When I was writing The Difficult Farm I was inspired by a process of thinking of only one word at a time, getting to constantly surprise myself. With The Trees The Trees it was prepositions that got me going, and some questions about the line. Lately it’s been color and light. My reading is always waking me up to new possibilities, whether I’m reading poetry (Inger Christenson’s Alphabet is very much with me right now), or something else (Richard Dawkins, for instance). Is there anything you would like to say to the people who are considering coming to the reading on the 24th? It’s going to be fun. Not indoor-fireworks kind of fun, but still pretty great. 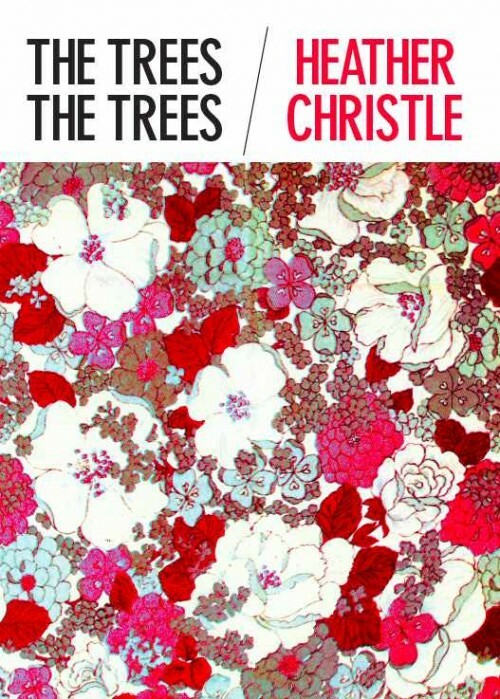 To celebrate the release of her new collection of poetry, The Trees The Trees, Heather Christle is reading poems by phone to anyone who calls 413-570-3077. Tomorrow is the last day. I just called myself over my lunch break. I didn’t know whether it was going to be reminiscent of my childhood public library’s Dial-a-Story, where you could call 448-1222, and listen to a recording of a librarian reading a children’s story. It is not that. Heather herself answers, her voice alight like bubbles. You can choose a poem or not. She will read to you. It will be good. She read to me “The Plan,” and it was good. It made smiles on my face. It could be this poem that was recently published at Everyday Genius. Read the rest of the poem at Everyday Genius.